Millie- say don’t feed them ANY grains at all, especially the first year! 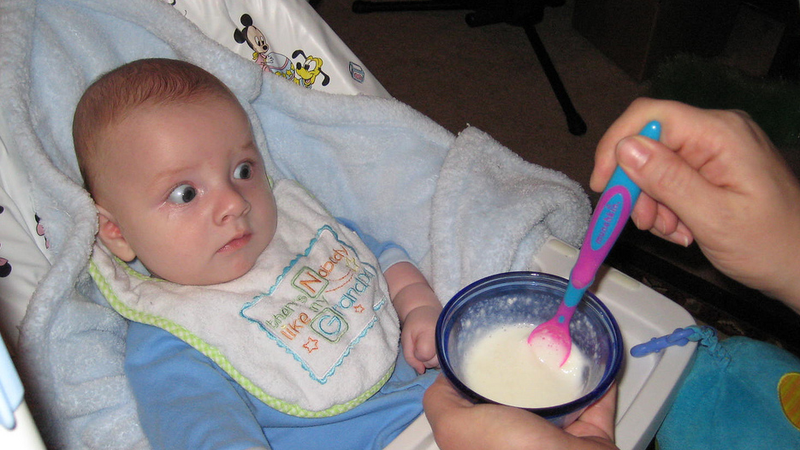 Rice cereal is a popular first food for babies. It’s also kind of high in arsenic, says the Food and Drug Administration, so if your kid gets a steady rice cereal diet, it’s time to diversify. Pregnant women, likewise, should avoid relying heavily on rice in their diet. At very high levels, arsenic can interfere with a baby’s brain development. Brown rice carries more arsenic than white rice, and some rice-growing parts of the world have more arsenic than others, Deborah Blum writes at Undark. Arsenic has also been found at high levels in organic brown rice syrup, which is used as a sweetener. Currently, the FDA does not set a limit on the amount of arsenic that can be in rice products. In a recent analysis, they sampled infant rice cereals and other foods. About half (53%) had levels above the European Union’s cutoff of 100 parts per billion. Non-rice foods were all below that level. The report doesn’t name brands, but baby food maker Gerber quickly wrote a letter to families pointing out that their rice cereals were all below 100 ppb. The FDA has more information on arsenic in rice here.You can read their recent warning to parents at the link below.